Dedicating yourself to a healthy lifestyle is all about one idea: commitment to change. It is not just about commitment to going to the gym or eating healthy, but committing to changing your entire life. It is hard to go to the gym each day and perform the same routine. Working out should be a fun learning process, where you come to understand yourself and your body more than you did before. We are all Mason students, which means we have a desire to learn. However, our learning should not only be limited to the classroom. I like to think of the gym as just another class. Granted it can be more fun than a class, but it can also be just as tedious. The great part about working out is that you get to make it what you want. As students, we are limited by what the teacher decides we will do. However, at the gym we are allowed to explore in any number of ways. This does not mean that you should simply go to the gym and pick whichever exercise looks the most fun. Working out requires you to do your homework before you even think about exercise. You need to decide what you want to gain from your workout. Do you want to gain muscle or shed fat? Do you want to work on a certain part of your body? Are you preparing for some type of athletic event? You can go to the gym and see someone doing a new exercise, or learn how to use a new machine, but you still want a basic game plan heading into your workout. One of the most overlooked aspects of working out is stretching. 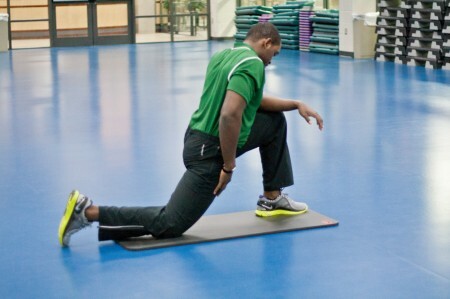 The purpose of stretching is not to bend over and simply touch your toes. Rather, stretching should be another component of learning and training your body for new activities. Lunging is a great exercise to perform for your legs, and it is one that is often overlooked. It is a good way to get your body ready to run on the treadmill, as it gets blood moving through your legs. I know some people who do not like to perform lunges because they claim it is a difficult exercise. I completely agree, but I take that as a challenge. If I am in class and I do not understand a certain concept taught by the professor I make sure to work harder on that concept so I completely understand it. Just as you work to know calculus, you must work to know your body and its various weaknesses.